Have you ever had an emergency situation with contaminated fuel oil? We were recently contacted by a manager at a fuel terminal company in the northeast that receives, stores, and ships fuel for petroleum refineries and pipeline companies. All of a sudden they found themselves faced with a major problem at one of their terminals – 40,000 barrels of ethanol was contaminated with particulate. They didn’t know exactly what caused the problem, but if they didn’t purify the fuel quickly, they wouldn’t be able to sell it because it was very dirty and it did not meet the required cleanliness specifications. They simply performed a “clear and bright” test by pouring the ethanol into a clear glass jar and reviewing it for visible particulate and shades of color. Since the fluid was anything but perfectly clear and bright, it had to be filtered… fast. After listening to the manager explain the details, I knew that I could help them out by installing on site a temporary rental filtration skid for ethanol fuel. 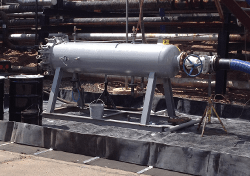 We dispatched our rental service team to their liquid terminal and our guys immediately set up a high-flow portable filtration vessel with a flow rate of 3,000 barrels per hour. We transferred the dirty ethanol from the primary storage tank, through the filter vessel, and into a secondary storage tank. We then tested the fuel again using the “clear and bright” guidelines… and it passed! The manager was very pleased that we acted so quickly, safely, and efficiently. The company was then able to continue selling the fuel to their customers. Success once again! Do you have a question about fuel filters or about liquid filter systems? Feel free to contact us anytime. Our friendly team of experts will be happy to help you out with your particular issue.